Cooper Kupp > Jerry Rice. OK, maybe not, but he's good. The only FBS game on the college football slate this week is Army-Navy, which is in Baltimore this year. Since there are no Army or Navy prospects worth pointing out as potential Eagles targets (much less five), let's take the opportunity to point out five small school players who could interest the Birds, that you would probably never actually watch on Saturday. Kupp isn't a burner, but as you can see in the highlight reel above, he makes catches that should otherwise be incompletions, and he's difficult to tackle once he has the ball in his hands. 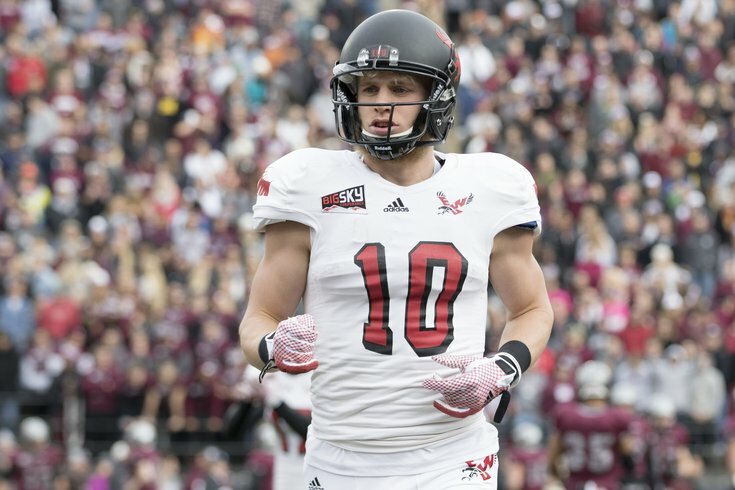 Kupp will compete at the Senior Bowl this year. In 2016, Brown has 97 catches (leads D2) for 1563 yards (second in D2) and 22 TDs (second in D2). Hopefully, he'll get an invite to the Senior Bowl, where NFL teams can evaluate him against better competition. In case some of the highlights above looked out of the ordinary, that was a tight end breaking some tackles and getting yards after the catch. The Eagles already have three tight ends in Zach Ertz, Brent Celek, and Trey Burton, so why would they draft another one? Well, to begin, Doug Pederson wanted to keep four tight ends coming out of training camp, but Chris Pantale simply was not worthy of a roster spot. And so, the Eagles have rolled with three so far, and on occasions in which Ertz or Burton have been hurt, OT Matt Tobin has filled in at tight end. The Eagles could add a tight end, whether that be in free agency, the draft, or as a priority undrafted free agent. In a draft class loaded with tight end talent, a guy like Everett could be available in the mid-to-late rounds. Everett has accepted an invite to compete at the Senior Bowl. You don't see much in the way of Davenport physically dominating players at a much lower level of football. Ideally, you'd like to see guys bouncing off him like he's Christian Okoye in Tecmo Bowl, but that's just not there. The book on Davenport is that he's long and athletic, which of course is always appealing at OT at the pro level. Davenport's Combine and Senior Bowl performances (should he compete there) will be important to where he gets picked. Obviously, the Eagles have a need to develop offensive tackles, with Jason Peters' retirement coming soon. Don't look now, but FCS schools are cranking out NFL draft picks. Davis figures to be yet another after the 2016 season concludes. Turn on the tape and you'll see the first-team All-SoCon defensive end giving Florida State's heralded tackle, Roderick Johnson, all he could handle with powerful inside charges and trips around the edge as a rusher in a November game last year. Davis plays with solid strength at the point of attack and a hunger that drives him through the whistle. He might not be a high-end athlete by NFL standards, but he's a productive, driven player. As we noted last week, Connor Barwin will count for $8,350,000 against the cap in 2017, $7,750,000 of which the Eagles can save if they cut or trade him. If indeed they decide to move on from Barwin, the Eagles will need to add to their edge rusher stable (which should probably be a priority anyway, even at times when it's a position of strength).